All the ChemSense QuantTab™ Chemical Concentration Determination Cards can be read to obtain quantitative concentration values in seconds using the DD-04L-C Quantitative Reader. Formaldehydeis a toxic material that can kill bacteria and viruses as well as damage human cells. Food manufacturers sometimes add formaldehyde to foods such as milk, noodles, meats and other foods to extend their shelf-life. Excess Formaldehyde has been reported to cause cancer and cause breathing difficulties. ChemSee now offers easy to use quantitative QuantTab™ Determination Cards for testing food and drink samples for the presence of Formaldehyde. Azides are toxic and pottentially explosive chemicals that are used in many applications including airbags, bullets and in certain drugs. ChemSee now offers easy to use quantitative QuantTab™ Determination Cards for testing food and drink samples for the presence of Sulfites. Sulfites are common additives in many foods and drinks. Sulfites are added to foods to prevent spoilage and as a preservative, and are also added to wines, beers, fruits, vegetables, medications, and seafood to stop them from discoloring. Unfortunately, 5-10% of people are susceptible to allergic reactions due to sulfite containing foods and drinks. ChemSee now offers easy to use quantitative QuantTab™ Determination Cards for testing food and drink samples for the presence of Sulfites. Hydrogen peroxide is used in food production to sterilize lines, including those carrying various foods and food ingredients. For example, lines which carry milk, processing vessels, and milk jugs are sterilized prior to filling to kill bacteria and prevent contamination of the fresh milk. Hydrogen peroxide has been shown to cause damage to the heart, lungs, arteries and veins upon ingestion. ChemSee now offers easy to use quantitative QuantTab™ Determination Cards for testing food and drink samples for the presence of Sulfites. Nitrate is a commonly occurring compound in many foods. It is also added during processing to increase the bacterial resistance and color preservation of many meats. High concentrations of nitrates can be damaging to sensitive individuals, especially small children, the elderly and livestock. ChemSee now offers easy to use quantitative QuantTab™ Determination Cards for testing food and drink samples for the presence of Nitrates. Nitrite is a commonly occurring compound in many foods. It is also added during processing to increase the bacterial resistance and color preservation of many meats. High concentrations of nitrites can be damaging to sensitive individuals, especially small children, the elderly and livestock. ChemSee now offers easy to use quantitative QuantTab™ Determination Cards for testing food and drink samples for the presence of Nitrites. Borax is used in food production as a preservative and an anti-fungal. Borax has been banned in many countries as an additive in food because of its toxicity to the liver. ChemSee-Foods now offers easy to use detectors to determine if Borax is present in Drink and Foods. ChemSee now offers easy to use quantitative QuantTab™ Determination Cards for testing food and drink samples for the presence of Borax. Chlorine is used in food production to sterilize lines, including those carrying various foods and food ingredients. Chlorine has been shown to cause damage to the heart, lungs, arteries and veins upon ingestion. 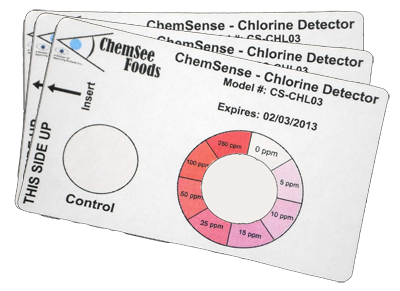 ChemSee now offers easy to use quantitative QuantTab™ Determination Cards for testing food and drink samples for the presence of Chlorine. For pricing and additional information on the ChemSense QuanTab™, please Request a Quote.